Genetically Modified Food Crops: A Clear and Present Danger? Do genetically modified food crops present a clear and present danger? New research and common sense suggest the affirmative. There appears to be much controversy concerning health safety issues surrounding the farming of genetically modified (GM) food crops and its impact on public health. Recent research reviewed below indicates that significant health risks associated with GM crops do in fact exist. In my view, the so-called controversy is actually a public relations campaign especially by Monsanto to deceive the public, legislators, and regulators into thinking that GM crops and the methods to farm them present no health threat. The chemical industry, which now often includes a biotechnology component, has a long history of misleading the public and regulatory bodies concerning the dangers of their products. There are many cases of cover-ups and misinformation ultimately followed by the banning or very tight regulation of some of their products. For example, DDT, PCBs, and Agent Orange (which contains dioxin and 2,4-D) come to mind. What is happening concerning the “controversy” surrounding the farming of GM crops has some remarkable parallels with the behavior of the tobacco industry when data began to appear suggesting a link to lung cancer. What happened in the tobacco industry is recounted in an article by Robert N. Proctor, Ph.D. at Stanford University titled “The history of the discovery of the cigarette–lung cancer link: evidentiary traditions, corporate denial, global toll” cited below. Today it is well known and accepted that lung cancer is caused by smoking tobacco. That this might be the case was first proposed in the late 1800’s. By the end of the 1950’s evidence for a link between cigarette smoking and lung cancer was definitively proven by multiple and diverse sources of evidence, including epidemiology studies, animal research, studies of cell pathology in smokers, and identification of cancer-causing chemicals in cigarette smoke. However, it was not until 1964 that the Surgeon General formally declared that cigarettes cause lung cancer. Before and after the Surgeon General’s report on smoking, the tobacco industry denied any link between cigarette smoking and lung cancer. The industry developed marketing campaigns to confuse the public and make it appear that the link between tobacco and cancer was still controversial when it was not. These sorts of tactics are used by the chemical/biotech industry today with regard to the safety of GM crops and the herbicides and pesticides used with them. Monsanto is one of the largest producers of GM crop seeds and herbicides used in farming. The industry relies on the ignorance of the public and puts up smoke screens to confuse those who express safety concerns. Contrary to Monsanto’s propaganda, GM crops do not offer any altruistic redeeming qualities. 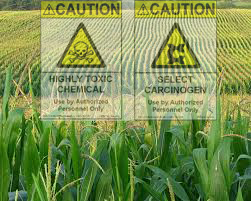 As I see it, there are two aspects to issues of health safety surrounding GM food crops: (1.) potential dangers imposed by eating the plants themselves and (2.) dangers arising from the herbicides and pesticides used to farm them. GM crops present their own set of health risks that I discussed in a previous article on this topic. Monsanto likes to focus the discussion on the safety of the GM crops because it is easy for the public and regulators to accept the notion for example that GM corn or soy are really not noticeably different from the native plants. They both look and taste the same. However, they are not the same because the physiology of the GM plants has been altered through genetic engineering. I believe that focusing on the plants is a ploy by Monsanto to distract attention from a more ominous, clear and present danger—the massive use of glyphosate, the herbicide in Roundup. Monsanto’s GM crops are called “Roundup Ready” because they were created to be resistant to large amounts of Roundup. This was done with the sole purpose of selling huge amounts of Roundup. Some non-corporate farmers do not realize that Roundup Ready crops are GM crops. Epidemiology was key in the case of tobacco because prior to widespread smoking of cigarettes, lung cancer was virtually unknown. It was so rare that when a case was found, physicians and medical students would gather to see it because it might be a once in a lifetime opportunity. The World Health Organization (WHO) recently announced that after review of available research on glyphosate that it is a probable cause of cancer in humans. The research accepted for review by the panel was vetted to assure that the authors had no conflicts of interest with industry and that the research was published in respected, peer-reviewed journals. The report includes glyphosate as well as other herbicides and pesticides. The WHO announcement can be found here. Sources of the research findings included in the WHO panel’s review, some of which are summarized in the next two paragraphs, are reviewed in the WHO report published in the Lancet Oncology which can be found here and reviewed comprehensively in the WHO monograph found here. Examining disease incidence in potentially high risk populations such as farm hands and farm workers may have merit. Glyphosate was found in the blood and urine of agricultural workers. Case-controlled studies of occupational exposure to glyphosate in the US, Canada, and Sweden has shown an increased incidence of non-Hodgkin’s lymphoma. This approach has also found increased incidence of prostate cancer among agricultural workers exposed to other pesticides. Convincing evidence was also found that glyphosate can cause cancer in animals. It is possible, as with tobacco, that a link could exist between some rare form of cancer and pesticides or GM crops. Animal studies in mice and rats found that glyphosate induced increased incidence of several cancers, including a rare renal tubule carcinoma. Others included pancreatic adenoma, haemangiosarcoma, and skin tumors. Glyphosate was also shown to induce DNA and chromosomal damage in mammals and in human and animal cells in vitro. Such damage can trigger cancer. Huge amounts of Roundup are used in the farming of GM crops. According to the Organic Consumer’s Association there are a number of studies suggesting links between glyphosate and a wide variety of diseases and health problems. The article found here summarizes the findings. If you are wondering whether pesticides used in the farming of conventional and GM food crops actually get into our bodies when we eat these foods, take a look at the short video below. This pilot study in Sweden clearly shows that we ingest and absorb pesticides into the blood, which find their way to the urine, when eating non-organic (i.e., conventional and GM crops) foods. These days, at least in the US, that means a lot of GM crops. The study tested for insecticides, fungicides, and herbicides, such as 2,4-D but not glyphosate. I have no doubt that high levels of glyphosate would have also been found in this pilot as in other studies. Glyphosate and 2,4-D are the most widely used herbicides in the US. Both are toxic and carcinogenic. The discussion of GM crops focuses too much on the crops and not enough on the fact that farming of conventional and especially GMO crops results in the deposition of large amounts of pesticides and herbicides on the crops and into the environment. This leads to higher residues in and on the crops we eat. Organic farming does not use the above mentioned herbicides. Organic foods are a bit more expensive, especially for large families, but what is the health of your family worth? In my view, reason and caution trump the so-called “controversy” promoted by the chemical and biotech industries, especially Monsanto. It seems to me that it is only common sense that chemicals that poison plants, fungi, insects, mice, and rats are also poisonous to humans. Bear in mind that in order for toxins such as herbicides and widely used neonicotinoid insecticides to work, they are absorbed into the plant’s tissues. This means that they cannot be removed by washing the plant before consumption. The fact is, we don’t know with any certainty what levels of these poisons will produce health problems in humans. There needs to be more research in this area. Just because a clear link between pesticides used in farming and cancer or other diseases in humans has not been definitively shown yet, does not mean that they are harmless. The results of animal studies clearly say otherwise. The creation of herbicide-resistant GM crops by Monsanto provided the springboard for its billion dollar sales of Roundup worldwide. If the public rejects GM crops, then sales of Roundup will drop dramatically, along with the threat it poses to human health and the environment. It is time for governments and regulators to discharge their responsibility to protect the public health and environment. It is also time for the public to relentlessly apply pressure every way they can to get GM foods labeled and to push for a ban or tight restrictions on the use of glyphosate and other herbicides and pesticides shown to cause cancer and other health problems in animals and/or humans. Genetically modified crops do indeed present a clear and present danger. Guyton KZ, Loomis D, Grosse Y, El Ghissassi F, Benbrahim-Tallaa L, Guha N, Scoccianti C, Mattock H, Straif K (May 2015). “Carcinogenicity of tetrachlorvinphos, parathion, malathion, diazinon, and glyphosate”. The Lancet. Oncology. 16 (5): 490–1. Proctor, Robert N. (2012). “The history of the discovery of the cigarette–lung cancer link: evidentiary traditions, corporate denial, global toll.” Tob Control 21:87-91. Available online at http://tobaccocontrol.bmj.com/content/21/2/87.full (Accessed November 8, 2015). GMOs (genetically modified organisms) Part 1—What Are They and What’s All the Fuss? This entry was posted in Health, Uncategorized and tagged cigarette smoking and cancer, genetically modified crops, glyphosate, GMOs, GMOs and cancer, Roundup, WHO, World Health Organization.